"Casting all your anxieties on him, because he cares for you. Be sober-minded; be watchful. Your adversary the devil prowls around like a roaring lion, seeking someone to devour. Resist him, firm in your faith, knowing that the same kinds of suffering are being experienced by your brotherhood throughout the world." 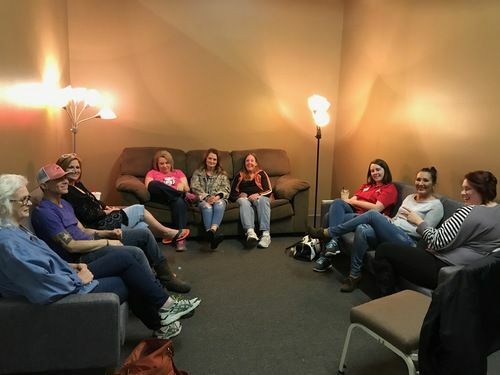 Celebrate Recovery is a weekly program that meets every Tuesday at 7pm. The goal is to spend time together and Celebrate God’s healing power in lives through the Eight Recovery Principles based on The Beatitudes. This experience allows us to “be changed”. We believe sharing our experiences, strengths, and hopes with one another opens the door to recovery. In addition, we became willing to accept God’s grace in solving our life’s problems. Through the Christ-centered Biblical principles we begin to grow spiritually and become free from our addictive, compulsive, and dysfunctional behaviors. This ministry is for people of all ages. It helps resolve pain in context of the church and is open to anyone who has hurts, habits, or hang-ups. As we progress through the Biblical principles and eight recovery steps, we discover our personal, loving, forgiving, and Higher Power – Jesus Christ.